Okay, it's not so much a secret as A CELEBRATION! beautystoredepot.com is celebrating 10 years as the enthusiastic, quality driven beauty retailer you have come to know and love. And we are celebrating all month with deals, specials - even an event right here in Austin! Kimberly started us off last week with her awesome blog about her TEN favorite products and I'm going to continue this week with mine. Keep an eye not just on our blog, but also on our Facebook, Twitter and Instagram accounts for special links, deals, and codes. We're Easter egg-ing them everywhere so that you, our beloved customers, can celebrate this huge anniversary with us. After all, we wouldn't be here without you! Without further ado, here are my ten favorite products, selected carefully after a year of sampling and buying and falling in love. One year for me, ten for beautystoredepot! Happy birthday, BSD! 1. SircuitX-Trap Gentle Cleanser - So, my coworkers (and even my family members) are sick of hearing how much I love this cleanser. What can I say? This is the product that converted me from a drugstore skincare shopper to someone who can pick up a packet of face wipes and read through the ingredients, understanding what will and won't work for my skin. This is the product that introduced me to the idea that skincare, my skincare, matters. Details like 'chirally correct' and 'all natural' aren't just a sales pitch, they are features that tell us a ton about not only what we're using, but who we're buying from. And yes, it is a gentle cleanser, one that foams up beautifully, leaves my skin feeling truly clean, and one that I feel good about using. I love this cleanser!! 2. RXSystems Maximum Strength Moisturizer - Those of you who have been paying attention know that I have ridiculously sensitive skin. Like, embarrassingly sensitive skin. Like, when I switched desks at work, because the new phone hit my face in a different place, I broke out immediately that night. And only in the place where that new (and newly cleaned) phone touched me. It's pathetic. As you can imagine, every single time I switch products or try a new product, I also break out immediately. I usually have to use a product for about a week before even the gentle, sensitive skin specific items stop making my face breakout. That didn't happen with this moisturizer. I ran out of my drugstore moisturizer, bought this on a whim, and was blown away by the clean scent, the light feel, and the completely awesome way it did not turn my face into a miniature mountain range. Because of my experience with this moisturizer, I trust that RX Systems is a safe brand for me to experiment with and I’ve done so happily! 3. GloTherapeutics Eye Restore - As my bio at the bottom of the page mentions, I'm not a huge fan of multi-step programs. Asking me to cleanse, tone, treat, protect, moisturize, exfoliate, AND mask my face on a regular basis is like asking a polar bear to hang out here in Texas - it just isn't going to end well. For some reason, the exception that proves the rule is my deep, deep love of eye products. I really have no idea what this is about, but it's true! I will actually go out of my way to use an eye product. Thus far, my favorite has been this one. I love how silky and hydrating it is, I love the ease of distributing a very small amount to my finger and applying it without feeling like I'm going to accidentally tear what I know to be very sensitive skin. Does it help? I think so. The skin under my eyes looks brighter, the dark circles less noticeable. It's definitely worth putting on every night before I go to bed! 4. CurlistoNatural Curls Conditioner - When I was very young, my mother would express concern about my ‘rat's nest hair.’ In all fairness, at that age it did look that way and I couldn't have cared less. As you might imagine, now I care a bit more. Proper care (and effort) has turned the rat's nest into a nightmarish mane of curls instead. And I have learned to love them. Part of learning to love them, though, was finding what works and what doesn't, which can be tricky for everyone. It has been one of my projects here at beautystoredepot to test the curl products and find out how all of them work. 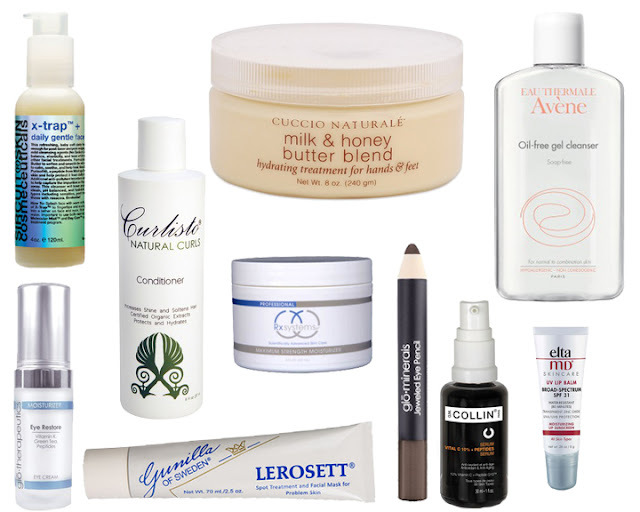 My favorite, my absolute favorite, has been the Curlisto Natural Curls Conditioner. It smells amazing, for one thing, but it also hydrates my hair so thoroughly that I can comb through it easily the next day. I use a small amount every day, even between shampoos, to keep the curls hydrated, tamed(-ish) and happy. 5. GloMinerals Jeweled Eye Pencil - Remember the bit about being pretty low maintenance about skincare? Well, makeup is basically the same for me, and that means these eye pencils are the BEST THING EVER! Seriously, I have one on me all the time. Currently I'm carrying Antique, which is a beautiful coppery brown with gold flakes. This time of year it's perfect for my skin tone - it doesn't feel or look like a shadow so much as a hint of sunshine on my eyelids. Yeah, that was pretty corny, but you don't understand how strongly I feel about this product! I have three of these pencils (in Fizz and Bark, too) and I've bought and given them to a number of friends and family members. Not does one application last all day, but the saturation depends completely on you! At work, I use a light line, blended with just my hands. After work? I darken the outer corners of my eye with a more saturated application, maybe throw a lighter shade along the inner corner, and throw on some mascara. In thirty seconds I’ve made a striking 'smoky eye' without leaving my desk, without needing brushes or sponges and without making a mess. I really think you can't ask for more from an eye shadow. 6. EltaMDUV Lip Balm - I like lip balms, though before working here I was all about my go-to drugstore brand. Listening to my Elta rep talk about her experience working in an oncologist's office changed everything for me. The horror stories about cancer on people’s lips were unbelievable. And once she broke it down, it seemed ridiculously simple. Oils on your lips capture sunlight, focusing UV rays on your mouth. Hopefully you all wear sunblock daily to protect your beautiful skin, but any lip balm that doesn't play by those same rules is a gamble with your health. I don't have Angelina Jolie lips, but I'd like to keep what I do have for a very long time! So I started using this UV Lip Balm. It keeps me safe. 7. CuccioBody Butter - When I ran out of lotion at work one day, I bought the Cuccio Milk and Honey Body Butter and was shocked to find that this worked, not only just as well, but better than my formerly-favorite brand. Now that I use it regularly, I know that my legs are remaining hydrated and protected for a solid 24 hours. Gotta love that! 8. G.M.Collin Vitamin C - If you're reading a beauty blog, chances are you know all of the wonderful, amazing, incredible things that Vitamin C does for your skin - brightens, lightens and tightens, right? Right. Well, here's the trick. Not all vitamin C is created equal, and that matters when it comes to your skincare. Rubbing a grapefruit along your face is not going to do a whole lot of good for your skin (you'd be better off eating it, please). Topical vitamin C does work, but it has to be applied in a form your skin can actually work with. There are a number of brands who specialize in serums and whose delivery system is excellent and does work - G.M. Collin is one of those. I plan on looking like I'm in my twenties for at least another decade. This is how I'll make that happen. 9. AveneOil-Free Gentle Cleanser - Avene is one of those brands that focuses on doing a few things very well. Their thing is sensitive skin, be it from rosacea, hyperpigmentation, illness, procedure or birth. Even more so than RX Systems, this is a brand that I know without a doubt I can use. I tried a concealer once that immediately broke me out into huge welts of irritated skin. Stubbornly, I waited it out a couple of days to see if it would change. Giving up, I put an Avene serum on it and within a day the swelling had gone down. I trust Avene to soothe and to heal. I chose their Gentle Cleanser for this particular list because I cannot emphasize enough the importance of removing impurities from your skin every single day, morning and night. Don't forget (as our Instagram reminded you last week) you're supposed to change your pillowcases every three days because we spend eight hours mashing dead skin cells, oil, dirt and impurities into our skin every single night. I leave this cleanser in my shower as a wonderful, bubbly way to wash my face in the morning as I get ready for work. Start off every day clean and end it the same way! 10. Lerosett Acne Clay Mask - I don't have terribly acneic skin, but with all of the ridiculous sensitivities I have, I do break out fairly often. This is the answer. Either as a full mask or as a spot treatment, using this product repeatedly clears up my little blemishes almost right away - especially if I can convince myself to leave them alone otherwise! It is a little pricey, so I prefer to use it as a spot treatment, but nothing feels cleaner to me, once a month, than a full face mask. For days afterwards, my skin feels brand new and pore-less. I'm a believer. Alright, ten products it is, one for every year beautystoredepot.com has been saving you money while delivering fantastic products and service. Stay tuned for deals and sales all month long! What are your top ten products? Let me know at customerservice@beautystoredepot.com!